Lives what dream: dolphins in the blue Caribbean if you’ve not yet lived the experience of swimming with dolphins means that you have not experienced one of the most intense sensations that are recorded in the human spirit. There are very few possibilities that man and Dolphin are at sea, therefore, Delphinus gives you a swim within reach of your possibilities, more real than ever, and that will change your way of conceiving life forever. With Delphinus you can live this experience transcendent, surrounded by a heavenly environment, crystal clear water, lush green and always blue skies. Delphinus is conformed by a team of first line: biologists, veterinarians and trainers work together to provide the best care to the dolphins and to create the necessary conditions for an optimal and safe swimming. Delphinus team is convinced that the most important thing is the health of dolphins and the satisfaction that they provide to each of their clients: the Mission of Delphinus is the welfare of the dolphins and the moments of happiness of the people. The team of biologists and veterinarians who work for Delphinus complies the Via Delphi Institute for research on the aquatic mammals, a civil association that conducts scientific research, both with the copies under the guard of Delphinus wild populations around the Mexican Republic. His work focuses on reproduction, behavioural analysis, medical innovation and population studies program. It is worth mentioning that the breeding program is one of the most successful worldwide, while field investigations, made mainly in the coast of Campeche, Tabasco, Yucatan and Quintana Roo, have yielded important data on the populations of bottlenose dolphins Tursiops Truncatus. The coaches group is in a continuous process of learning; for the first time in Mexico a set of coaches made a University certification in this area, supported by people of the stature of Ken Ramirez. 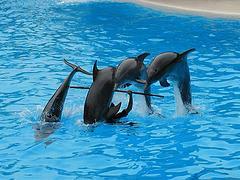 A current program that develop day with day coaches is that of training for medical interventions, through which teaches the dolphins so that voluntarily submit certain positions and attitudes so that veterinarians can perform their work comfortably without forcing the specimens, these include punctures, measurements, and collections, among other interventions. In addition, coaches are continuously working with dolphins in the making of new activities and creative swimming programs.